The main concept of a main street vegan is that most vegans are average, everyday people who came from meat-eating families and who simply have made the decision to stop eating animals. There's no stereotypical vegan anymore, if there ever was one. What that means for anyone on the fence is that there's a place for you, whether you're from a small town or a huge metropolis. Victoria herself came from Kansas City and grew up in a meat and potatoes town. She was overweight from childhood and says she spent a lot of time on diets of tasteless food and small portions. She was drawn away from eating meat at many points throughout her life but didn't fully go vegan until she was 30. Since then she lost 60 pounds and never again walked onto the yo-yo diet roller coaster. 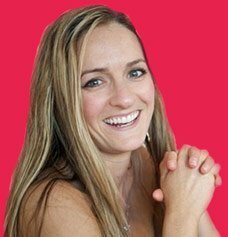 Victoria's writing exudes her fun, optimistic, and friendly personality, and reading reminds me of a discussion I might have with a friend in front of a few glasses of [vegan] wine. 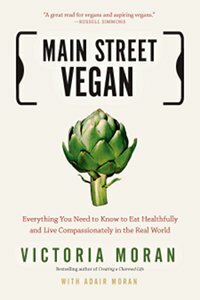 Main Street Vegan covers so wide a range of topics that you can be sure that any questions you have about veganism will be answered in depth. She covers the basics of the treatment that food animals deal with everyday, how whole vegan food is packed with nutrients, how to go vegan, what supplements you need to stay healthy, how to eat out in restaurants and while traveling, quick tips on cooking, cosmetics, household cleaners, vegan clothes, the soy and gluten debate, how to juice, and how to win over omnivores. You'll also find many fun recipes in Main Street Vegan, including an amazing one from her daughter Adair; a chocolate martini. I had no idea that Kahlua was actually vegan, and that opens up a whole new world of possibilities for fun alcoholic drinks. We can all learn from someone who went vegan 30 years ago, long before the time of artisan vegan cupcake bakeries, vegan cheese that really melts, or gourmet vegan restaurants. 1. In Main Street Vegan, you talk about losing 60 pounds on a vegan diet. How is going vegan for weight loss different than trying a typical diet fad? Before going vegan, I'd spent my whole life either substantially overweight or miserably dieting. As I vegan, I just live and eat and not worry about it. Now, in my case, I was a practicing binge eater, a food addict, and I did have to do the emotional/spiritual work to get past that before I could even go vegan. So, for anybody in that circumstance I recommend something like Overeaters Anonymous so you can get your power of choice back when it comes to eating. In my case, once I could choose, I chose vegan and everything got better -- weight, skin, energy, attitude, and more peace inside, too. 2. You look absolutely amazing for your age. From looking at your pictures, I wouldn't have guessed you were a day over 40, but you're actually 20+ years older than that. Do you feel like your diet contributes to your agelessness, and if so, in what ways? I really do. It amazes me how the aging process is working for me: it's almost as if it's in reverse. I don't know how long I can count on this -- I mean, time is time and gravity is gravity, and people do age -- but if anybody had told me that I'd look and feel the way I do at sixty-two, I'd have thought they were trying to sell me something. I'm sure genes are part of it -- my mom aged really well -- and I stay out of the sun, but I really think the diet is a huge part of it, not just for me but for so many really gorgeous, healthy, vibrant vegan women I see in their fifties, sixties, and seventies. The ones who eat the most raw food and drink fresh juices and have lots of greens glow the most. Of course exercise and meditation and all those youthening kinds of things help, but just not eating animals is huge. I believe it's partly nutritional and partly just good karma. Emerson said, 'Health and beauty are nature's gifts for living by her laws,' and when I look at vegan colleagues in the over-50 age group, I see it. 3. Many of our readers are young parents, and you raised Adair as a vegan from birth. What challenges did you run into with other parents or her peers, and what advice do you have for vegan parents to overcome those obstacles? I think if you're confident as a parent, people will respect what you're doing. If you have any doubt, they'll sense it on an unconscious level and come at you about protein and calcium and socialization and whatever else they want to disapprove of. Do your homework. Know enough about plant-based nutrition that you can field the questions, but basically, just love your kids and get excited about raising them in this beautiful, humane fashion. Kids love animals. We lie to kids about animals. We show them 'happy barnyard' books. Only two to three percent of farmed animals are in anything like a 'happy barnyard' and even they end up in the same very unhappy slaughterhouse. (I know: I spent a day in one.) So take your kids to farmed animal sanctuaries -- I have a list of them in the book -- and adopt a pig or cow and get pictures and progress reports. Then your kids will be their own advocates. 4. What is your favorite meal to make on nights when you're absolutely too busy to think? We eat a lot of really big salads shored up with 'oomph factor' -- heavier foods like avocado, steamed yams, sauteed broccoli, grilled tofu. It's so easy to just toss the baby greens in the bowl, cook up one 'oomph' item, and toss it all together with some cashew ranch or cheesy tahini (the cheese flavor comes from nutritional yeast) dressing I make on the weekend. Sometimes I'll get a gorgeous round loaf of spelt bread and serve that with the salad and it's a meal. In the winter, my husband loves 'Cheapish Chili' (the recipe is in Main Street Vegan) -- I can make it at night in ten minutes, or have it cook all day in the crock-pot. Same with soups -- carrot/ginger, potato-corn chowder, lentil or navy bean. I can also cook brown rice on the weekend and then can just steam it quickly and stir-fry some veggies and tofu or tempeh or meaty mushrooms (baby portobellos are good) with a little olive oil, vegetable broth, and tamari, and it's a good dinner. If there's no dessert, we have a little piece of really good dark chocolate. 5. I know quite a few vegans who want to share the amazing benefits of a plant-based diet with their friends and family, but receive negativity when trying to talk to them about it. What's your best advice on ways to encourage people to go vegan without making them feel pressured and resistant to change? I say in Main Street Vegatn: 'Bring good food to potlucks and wear nice shoes.' I try to answer questions without getting preachy. Sometimes I fail. That doesn't help anybody. No one wants to be lectured at. We're all doing the best we can today with what we know today and how we interpret what we know. I can't force anybody to be vegan or vegetarian or anything else. I can just live my life, try to be the best example I can, and accept people where they are. Because of the animal aspect of this, that we vegans see the animal food industry as a cruel and archaic thing, it's hard sometimes to be accepting and allow people to grow at their own rate. It helps to remember, for me anyway, that, first, I wasn't always vegan (good Lord, I even had a fur-and-leather coat as a teenager! ); and, secondly, that being vegan doesn't make me superior to anybody. I'm grateful that I got the vegan piece fairly early in life and that's terrific, but other people are adopting physically and mentally challenged children and doing other brave and important things that I couldn't. There was a lovely spiritual teacher back in the 70s and 80s who called herself Peace Pilgrim. She used to say, 'Live up to the highest light you have and more light will be given to you.' I think that applies here. It's more about shining your light and inspiring other people, rather than trying to so hard to convince them. 6. What's your best advice for someone who's really interested in becoming a main street vegan but still is a little apprehensive about ditching cheese or cutting out another animal product? Just start. You don't have to be perfect, just committed. Do this a day at a time: you're vegan till bedtime -- not such a big deal. Or drop one item at a time -- maybe chicken first, then eggs, then dairy, then fish, then beef -- in this or some other order. Or maybe you'll be vegan at home and still allow yourself some animal product or other when you're out so you won't feel you're doing a complete 180 before you're given yourself time to settle into the changes. Some people learn the ugly facts about factory farming and slaughter, or the dazzling health stats on what a whole-foods, plant-based diet can do for their health, and that's it: they're vegan overnight. Other people move veganward, getting comfortable with each step along the way. However you proceed, don't see this as some sort of discipline, or a process of 'giving up' something you want: what you want will change. See this shift as a grand adventure. Explore vegan culinary options. Frequent ethnic restaurants. Get a couple of cookbooks with recipes so good you can tell from just reading them that you're going to like this food. 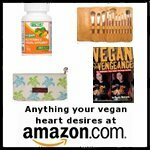 Read everything you can get your hands on about the plant-based diet and the vegan life. Get to know other people who are doing this. There are vegetarian and vegan MeetUp.com groups all over the country, even in small towns. Or you can make a family vacation of a veg event like the annual Vegetarian Summerfest in Pennsylvania and meet people from all over who are doing this, or aspiring to, and who'll become lifelong friends. Being vegan in a meat-eating world is challenging only because it's not the norm, but it's rapidly becoming another norm, and the benefits far outweigh the inconveniences. Many thanks to the Main Street Vegan. I hope you enjoyed learning more about her!